A better life in the future is in effect the promise made by all advertising. 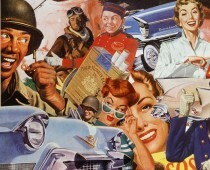 Beginning in the dark days of the Depression and accelerated during the War years, many American business adopted the future as an explicit leitmotif in advertising . Especially during the deprivations and sacrifices of WWII , the glittering promises of a post-war world filled with unheard of conveniences and an abundance of tantalizing technological advances as presented by Madison Avenue, gave hope to a war-weary public. In the post-war push button dream world, a man would travel in 300 mph trains, translucent automobiles, 4 decker planes, helicopters, buses equipped with cocktail lounges and amphibious jeeps. Television would bring the world to his living room and he could transact his business by walkie-talkie while bagging a brace of ducks. It was to be a world in which stockings never ran, fabrics never had to be washed, and intercommunication systems eliminated the need for a babysitter. Pants would never shine or lose their crease even in the rain since a man would ordinarily own several dozen synthetic suits, which after a wearing or two, he would roll up in a ball and fire into the automatic garbage disposer. The perpetrators of this thermoplastic, aerodynamic, supersonic electronic dream world of course were the Mad Men of Madison Avenue who during WWII had no current consumer goods to sell, who was forbidden to talk about his war production and yet had to keep his clients company’s name fresh in public memory. After he had said what there was to say about war bonds many times over, our ad man had nothing to talk about but the future, and so created desire. Oddly enough it was more likely to be the advertisers of foods or liquor who would drool about the coming wonders of electronics than the actual electrical manufacturer who might one day be challenged to make good on his claim. To learn about the future of the past I take a look at a series of ads run by Seagram’s Canadian Whisky entitled Men Who Plan Beyond Tomorrow. that ran during WWII through the early post-war years. Many of these prophesies seem fantastical , but many have a shed of truth or feasibility, provided the timing is not specified and it usually isn’t. The term tomorrow leaves a lot of leeway. The war-weary consumer could drift through the dreamland and make some distinction between the near and the not so near and between purposeful products and the purely fanciful. Travel has always been a popular topic to fantasize about. Air travel was still in its infancy and far from the popular choice of travel for the middle class. Transcontinental flights were unheard of. The American, in the postwar, was going to live in a house built of glass, plastic and maybe a slab or two of steel or aluminum which was bought in a department store, delivered in a van and erected in a few hours. Old McDonald wasn’t left out of the future fun. At a time when farm labor was scarce due to man shortage the idea of a totally mechanized farming was desirable and plausible. “Tomorrows Bomb Will Destroy Fires!” So claims the headline in Seagram’s 1943 ad. The airspace around the North Pole as envisioned by Seagram’s in this 1943 would have an unforeseeable twist. We would indeed monitor those future flights from Moscow, but they would be incoming Soviet bombers that we would be concerned about. Motorola had provided the army with Walkie Talkies so it was a natural assumption that they would catch on with the post-war civilian. It would be several decades before the ubiquitous cell phone entered our daily lives. I am the editor of a quarterly magazine called “Our USA” I have been following your blog for a while now and find it fun and informative. I am writing you to ask permission to use the article below for our next issue. We are a small grassroots publication, but growing. Although I am unable to offer compensation I can offer a bio box, head shot and mention of your url. You will also be mentioned on our website with link to your url. We have some exciting plans for our Spring issue, with press release, and possibly TV exposure. I am hoping that you will join us. You can check our website by clicking below.